Rustic country gardens are popular with people who live on large acreages or small suburban lots because the casual, retro vibe from salvaged treasures mixes well with natural materials and native plants, making us feel right at home. 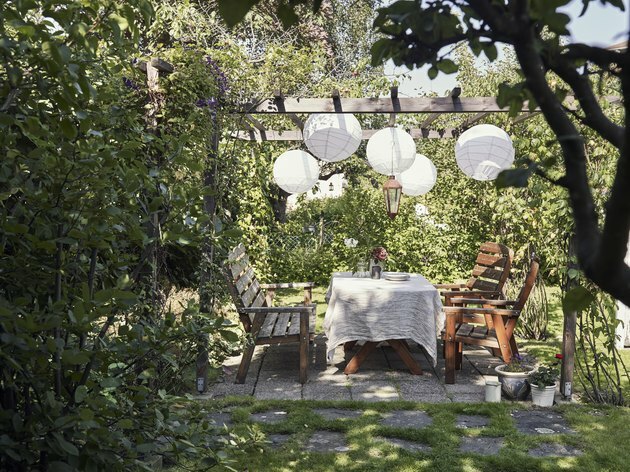 Although this style is flexible and shouldn't be formulaic, there are some key features you'll want to include in a rustic garden. If you plan well, your garden will provide you with places for peaceful relaxation and enjoyable physical activity. So, begin with a plan, remembering that gardens always change over time, and enjoy the process of developing and creating your rustic garden. 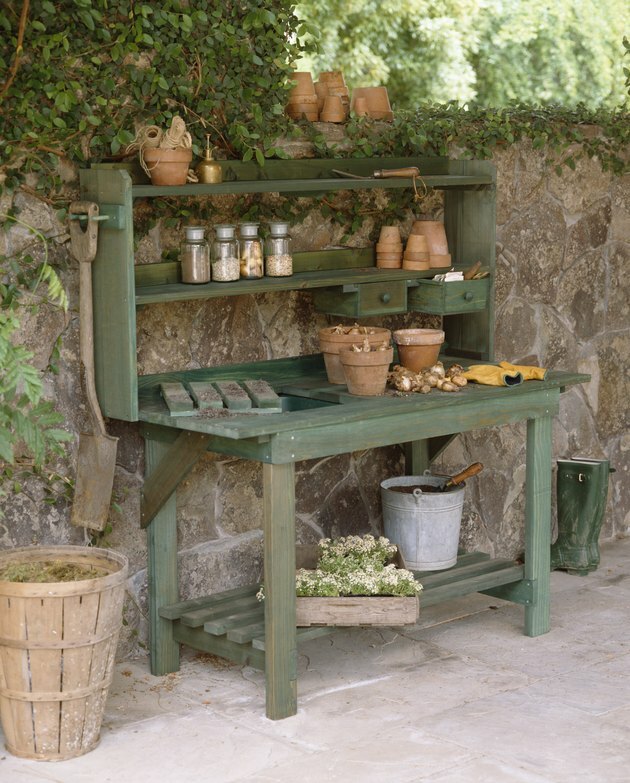 A potting bench provides workspace and a focal point for garden supplies. A country garden reflects its surrounding landscape: trees, rocks, meadow or lawn, and perhaps a scenic water view. Therefore, a rustic garden typically has a casual, natural appearance rather than a formal look with a lot of symmetry. Begin with the house as the focal point of the landscape and design waves of lawn and garden beds flowing from the structure. The first wave is the foundation planting around the house where plants grow closer together. Each subsequent wave should take on a looser, more natural appearance that gradually blends with the surrounding landscape. Consider the following tips as you begin to make plans. A foundation planting around a rustic building softens the transition from building to lawn and creates a welcoming entrance. If there are other buildings on the property, such as a garden shed, plan small-scale foundation plantings or gardens around them to integrate the entire property. Identify the main views from inside the house and place gardens where you can enjoy them from indoors. For example, add a small flower bed under a tree and wrap the flower bed around a small seating area where you can sip morning coffee or unwind in the evening. The pleasant scene will draw people outdoors. Keep sightlines open so you can take advantage of a view or watch children and friends playing yard games. How do you want to use the space? If you have a large yard, plan multiple seating areas for different times of day and different activities: a hammock for napping or reading, a small table and a few chairs for conversation, and a larger table for entertaining. Include space for walking around in a quiet area. Do you want to include a fire pit or outdoor fireplace? Do you want to grow vegetables in a separate garden? Some locations provide enough privacy that you can use the front yard as well as the backyard for living space, which is especially nice if the best views are from the front of the home. If you live on a large lot or an acreage, go big in proportion and scale when planning a porch, patio, deck, or pergola. Use plantings and paths to guide people through the yard in a gentle, meandering manner. Plant trees and shrubs in groups. A large property might benefit from a windbreak or shelterbelt planted to the north and west about 20 to 30 yards from buildings. One of the most important considerations in landscape design is how you want to use the space. Just as the garden design reflects the natural surroundings, so will the materials used in the hardscape. Local materials will look right at home and they will likely be less costly to buy. In fact, they might be free for the picking on your own property. 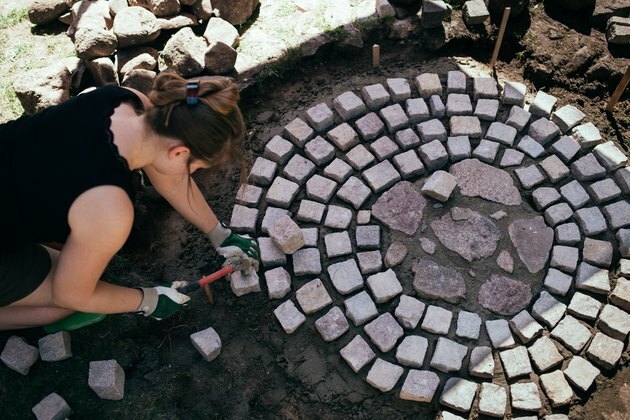 Where stone is abundant, use it to edge a garden, create a pathway or patio, build a firepit or retaining wall, or create an accent within a flower bed. Allow moss or low ground cover to grow between stones to soften the look. The rugged look of natural stone suits a rustic rustic garden. Use tree branches and twigs to create a rustic trellis, arbor, or small garden fence. Strap thin branches together to make a tomato cage or teepee trellis for climbing plants. And if there's an abundance of wood on the property, use cleared trees to make split rail fencing. A perimeter fence constructed of wood posts and wire can provide a suitable garden backdrop, keep children in the yard, and deter wildlife from entering. 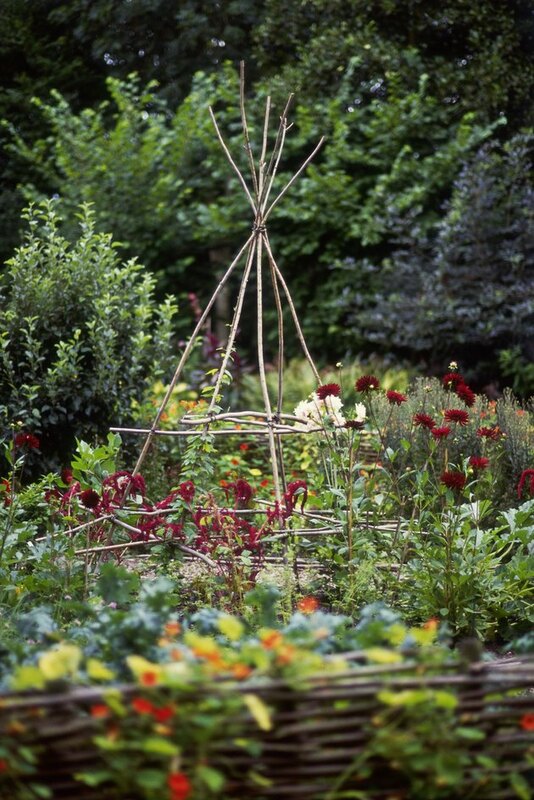 Use twigs to make plant tepees and small sections of garden fencing. Wood furniture and naturally stained lumber will blend in with the surrounding landscape, letting blooms and foliage take center stage. A wood pergola connects people to the landscape by creating an outdoor room for entertaining. Include rustic accents to express your personality and have fun. You might want to choose items you can change easily with seasonal transitions. Include found items or purchases from flea markets, antique shops, garage sales, and salvage yards. Again, scale the piece to the size of your property; however, don't shy away from displaying a relatively large statement piece rather than many small items. 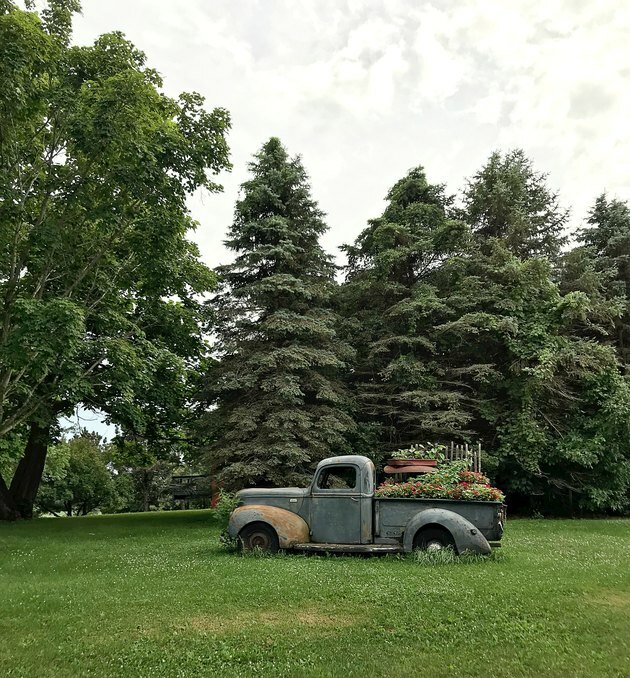 For example, a country garden surrounded by open fields can accommodate a vintage pickup truck to create a raised flower bed, whereas, a small suburban garden can include a vintage toy truck filled with flowering plants. 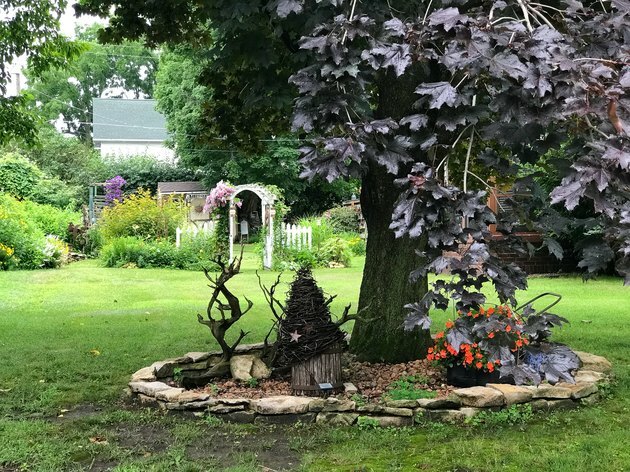 A country property owner takes advantage of abundant space and a backdrop of large trees to create a unique raised flower bed. 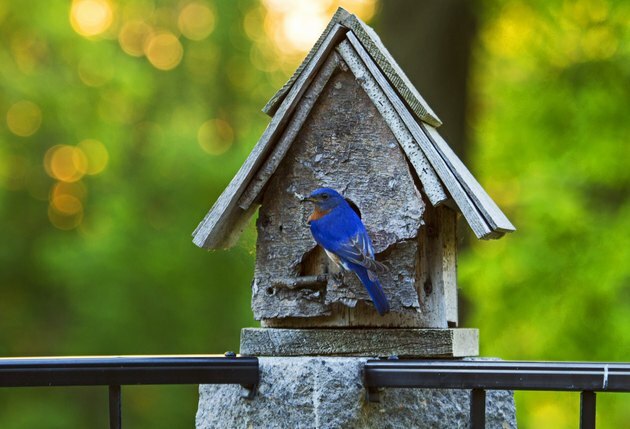 Make birdhouses from weathered wood or repurposed metal objects. Tuck a barn cupola or weathervane amongst tall garden plants. Use a rusty metal gate or fencing as a backdrop for tall plants and climbers. Build a dog kennel, small chicken coop, or rabbit hutch from weathered wood. Cluster small vintage objects together. to create one focal point. Restore and use weathered tables, chairs, benches, gliders, and porch swings to make a space comfortable and inviting. Create container gardens in new or vintage galvanized buckets, tubs, troughs, and livestock feeders. Build a shed or greenhouse and incorporate old windows, doors, and lumber. Mix in a few vintage enamelware bowls, cooking pots, and coffee pots in an herb garden. Build window boxes, awnings, and shutters from weathered wood or galvanized corrugated siding. Birdhouses add character and welcome colorful birds to the yard. Always start with plants that are native to your area and then add more unusual varieties for interest. Climbing roses extend a fragrant welcome to all who enter. 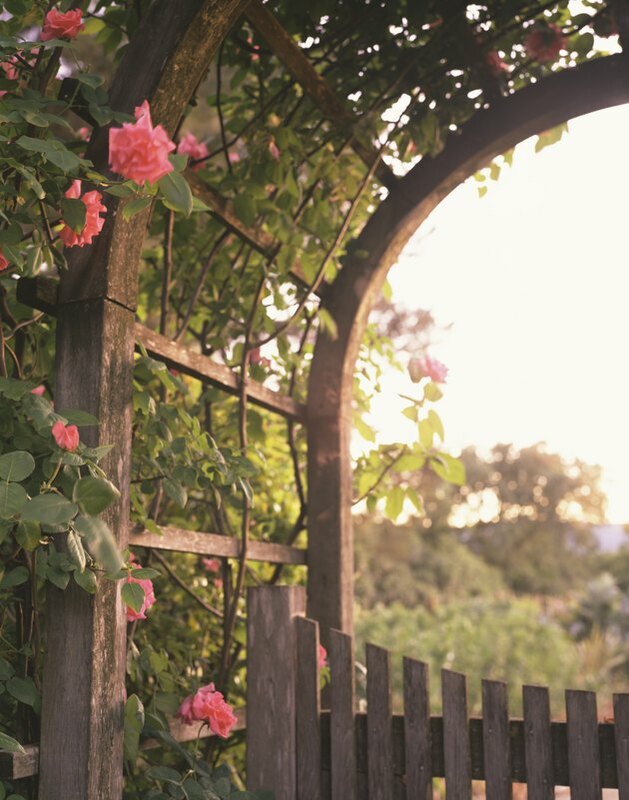 To adorn an arbor, trellis or pergola with greenery and blossoms, add climbing plants, such as morning glory, wisteria, climbing roses, or trumpet vine. Use simple pieces such as weathered branches, a bee skep, and potted flowers grouped together with a ring of stone to add interest to an otherwise bare spot in the yard. If you plan to include a vegetable garden in your yard, integrate it with the rest of the landscape design. Consider planting an herb garden near the kitchen, mixed in with the foundation planting. Create a cohesive design by edging the garden with similar stones or fencing used in flower beds. 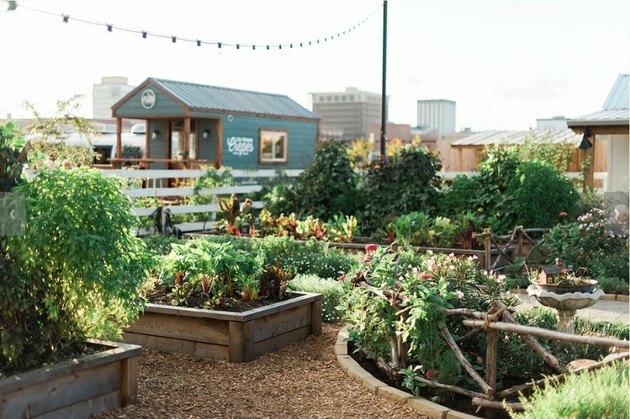 The Magnolia Market's Seed and Supply shop showcases both raised vegetable gardens and rustic vegetable gardens edged with stone and fencing made of tree branches.